Friends, today I have a special treat for you. Really special! Last year I met the loveliest lady through Twitter of all places! And she has the biggest heart for God. She is a true GEM in every sense of the word and someone I truly look up to as a mentor and amazing woman of faith. She has an incredible ministry called Roses and Rainbows, and she connects women all over the country through her COFFEE Communities. Early this year, I had the chance to chat with Kim over the phone a few times and just knew from her sweet "Hello!" that we were kindred spirits with the same heart for loving on and ministering to women. I was honored to lead the COFFEE community in Los Angeles this Spring, and incredible encouraged by her weekly teachings we watched via YouTube videos. Sisters, you need to get to know this lady. She recently published an incredible book and if you're looking for an inspiring, empowering read - this is it! I asked her to share a bit about her heart and ministry today, and I know you will be as blessed as I have been by her. Take a moment to follow her links below and get to know her, you will be so glad you did. Kim is the founder and president of Roses and Rainbows Ministries, Inc. She is an author and nationally noted speaker. She has traveled nationally for more than 20 years, speaking at retreats, conferences, and to Bible study groups. Her message and passion come from her personal experience of longing to be used by God yet feeling unusable because of past abuse leading to anorexia, diet pill addiction, anxiety attacks, and depression. Her mother’s death-bed challenge set Kim on the path of daring to be and do what God had purposed for her. 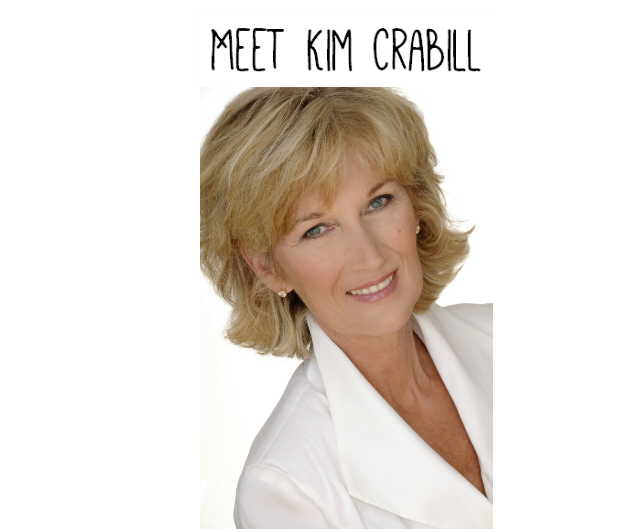 Kim is married to Lee Crabill, and together they have two sons. The family lives in Maryland. Along with ministry, Kim’s favorite place to be is wherever her boys are, and that is often on the water, swimming and boating. We long to be used by God; God longs to use us beyond anything we dare to imagine. So where’s the disconnect? We believe a lie, and are therefore held hostage to thinking our mistakes, shortcomings, regrets, and hurts disqualify us from God’s purposes. And so we try like crazy to hide our pasts from God and from each other. If we only sing a little louder in the choir, study a little harder for our Bible class, or smile a little wider at the potluck, maybe no one will notice how damaged our hearts are. The truth is that God uses us because of our pasts, and the more transparent we are about the burdens we carry, the more powerfully God can work through us. He can transform those burdens into blessings—for us and for the people around us. Transformation begins as we learn to recognize the lies and misconceptions that have made us feel useless for God’s great purposes. Next, we start replacing those lies with God’s truth as displayed in His character and promises. As truth invades our lives, we discover the confidence and courage to remove our masks and present our real selves to God and to others. Then hold onto your hats, because God will shower you with opportunities to bless people beyond your wildest hopes. Kim is happily busy assisting ladies all across the county create COFFEE groups. COFFEE stands for Conversations Of Friends of Faith to Encourage and Equip. We’re women, so we know what conversations are, right! And encouragement—well, we all need good doses of that to get through the complexities of daily life. As for equipping, one of the amazing results of Community COFFEE is that as we receive encouragement for ourselves, we become better equipped to encourage others as well. Kim makes it so easy, if you have the passion to lead a group, Kim will provide training, video teachings, discussion points! For more information, see the website and click on Community COFFEEs. 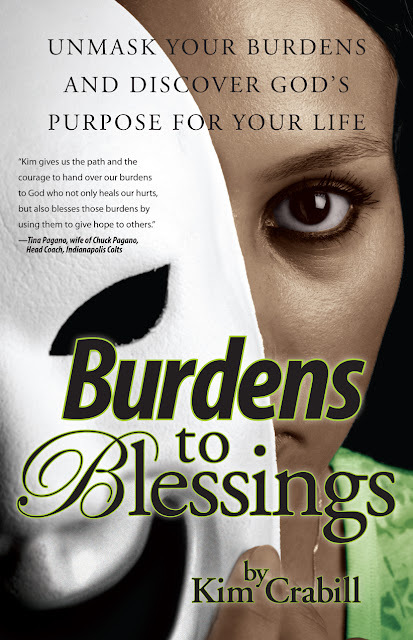 If you have read Burdens to Blessings and want to go further with what you discovered, or if you are just looking for a summer devotional, Extend the Blessings began June 3. It is a 40-day email devotional that will take a single Burdens to Blessings principle each day, pair it with a Bible passage, and suggest a way for you to reflect and respond to the message. You can join us at any time. I love to imagine all of us, wherever we are—California to Maine, New Mexico to Florida—engaging together with the same scripture and principle each day. Strong women believing and praying together in unison! To get the email devotional, reply to kim@rosesandrainbows.org ASAP with a “sign me up” in the Subject line of your email. Please also invite your neighbors, family members, Garden Club members, Sunday school class, and so on to join us. For more information about scheduling Kim,or her Roses and Rainbows Ministries, Inc., or her COFFEE gatherings, visit www.rosesandrainbows.org. I definitely want a new devotion when the time comes and when I can get one. I cant get into the one I got from my gma for cmas. It's 365 devotion for women. It's called "Mornings with Jesus 2013" If you have any for suggestion let me know. I'd love some suggestions. sometimes we all need to be reminded.